There are great mountain walks, there are epic mountain walks, and there is the Snowdon Horseshoe. Great, epic and intense. 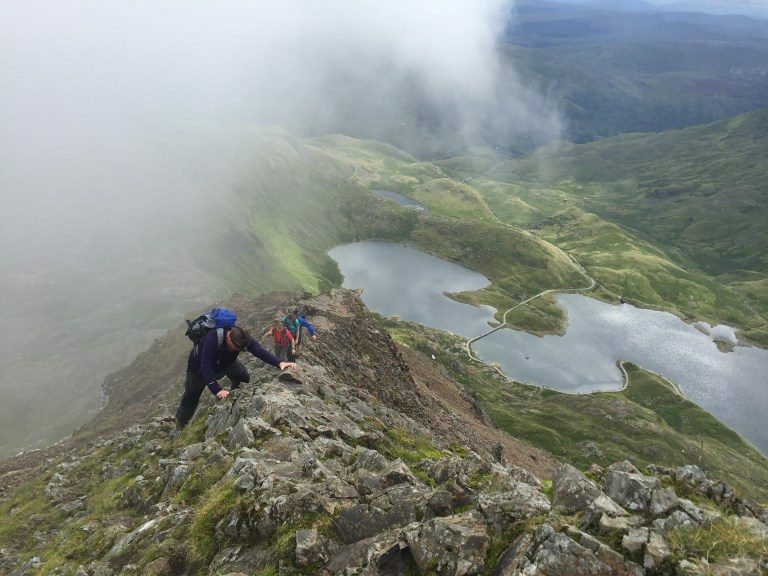 Spectacularly rugged and breathlessly beautiful, the Snowdon Horseshoe will send tingles down the spine of anyone who has an interest in hill walking. This is Snowdonia at its very best – a place of brutish, rugged peaks that skyrocket from the valley floor to summit in the blink of an eye. The drama builds with every step of this dramatic scramble around the rugged steep ridges of Snowdon’s mighty Cwm Dyli. Below, a vast amphitheatre awaits, surrounded by the high, craggy peaks of Snowdon, Garnedd Ugain, Y Lliwedd and the legendary ‘Crib Goch’. Only the hardiest of hill-walkers tackle the knife-edge ridges and the steep scrambles this legendary route has to offer. Your nerves, stamina and determination will be put to the test, but if you give it a try, I guarantee you will love every second of it. The Snowdon Horseshoe begins at Pen y Pass car park. Arrive early as it does quickly fill up. The Sherpa Bus can be taken from Llanberis but the service does not run that often so plan for this. 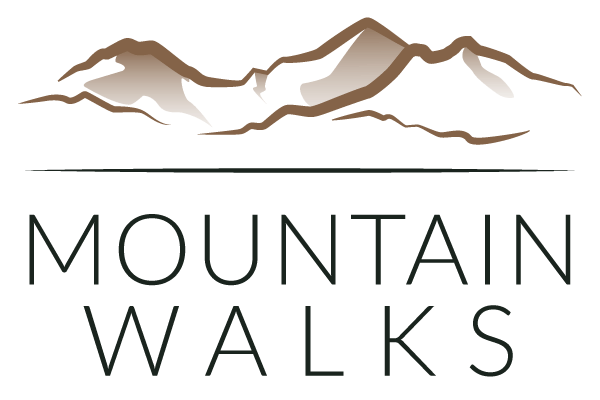 This is a walk that is thoroughly enjoyable from the get-go as you gradually ascend the rocky-stepped Pyg Track towards the dark intimidating pyramidal peak of Crib Goch with thoughts of the exhilarating scramble ahead on your mind. 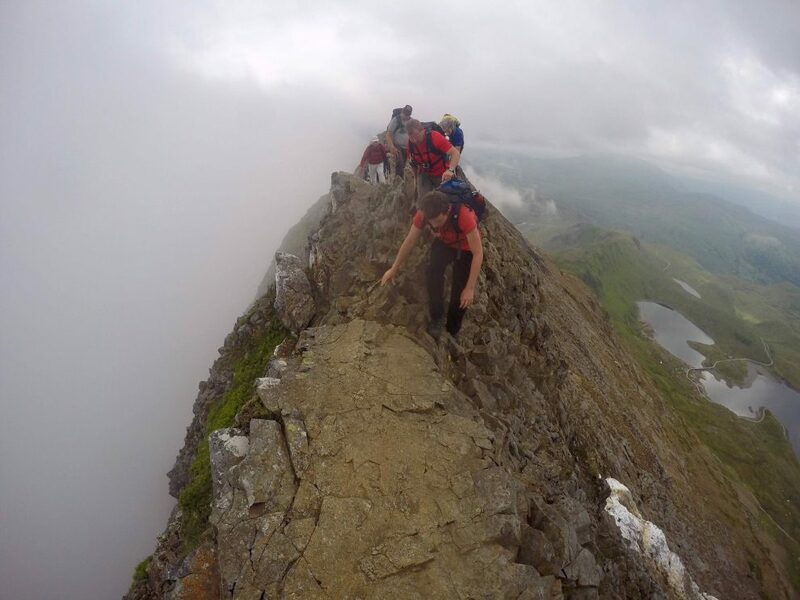 The route ahead looks daunting, and rightly so, as the Crib Goch traverse is one of the scariest and exhilarating scrambles in Britain, and not to be attempted by the novice hill walker. Follow the Pyg Track for 500m and fork right at the stile marked Crib Goch. An easy rocky path snakes up the mountainside to the base of East Ridge of Crib Goch. The scramble ahead may look daunting, the terrain is rough and steep, but after the initial ‘barrier’ the scrambling does gets easier if, you stick to the direct route up the ridge. The long and hugely enjoyable Grade 1 scramble comes to end as you meet the crest of the ridge and the full exposure of the ridge is experienced. This is not the place for those who suffer from vertigo. Sticking to the left of the knife-edge arête, carefully make your way (many shuffle) along the 500m ridge via the summit of Crib Goch (roughly 100m along the ridge). The final obstacles on the ridge are the three famous pinnacles which can either be avoided by skirting around the base, or tackling them head on. Scramble down the last pinnacle and you will be rewarded with the safety of some flat ground at Bwlch Coch which is the perfect place for a break. Garnedd Ugain and the scramble along Crib y Ddysgl is next on the circuit which is another exhilarating route offering some of the most stunning views in Snowdonia. The scramble to the summit of Garnedd Ugain is relatively straight forward and shouldn’t cause any issues if you pick a smart line. From the summit marker the views of Crib Goch are breath taking, as are the views towards Y Lliwedd and Snowdon. 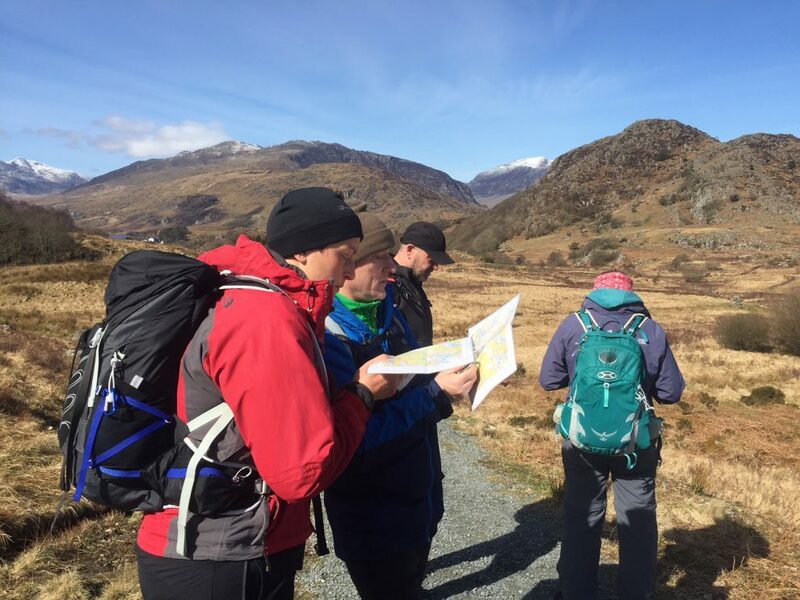 The route to the Snowdon summit is via the busy Llanberis Path. You will more than likely join hundreds of walkers on the final 1km easy uphill to the summit as three popular paths converge at this point. From the summit of Snowdon walk past the café heading south joining the path for the Watkin and Rhyd Ddu routes. The marker stone indicating the Watkin Path is visible after 200m so follow this east towards the rocky peak of Y Lliwedd. A loose scree paths takes you steeply down to the flat Bwlch y Saethau where amazing views of Cwm Dyli can be seen if you venture carefully close to the edge. Continue along the path, ignoring the main route down the Watkin Path, and start the scramble towards the summit of Y Lliwedd. The scramble offers multiple lines but the best route is near the edge allowing you to soak up the views and experience the exposure. The first peak of Y Lliwedd is the highest point, known as the West Peak, at 898m. Continue the scramble along the tops and over Lliwedd Back before a rocky visible path steeply descends the mountainside towards Llyn Llydaw. Cross a small bridge the path joins the Miners’ Track for the final 2km easy stroll back to Pen-y-Pass via Llyn Teyrn. Take a look behind and as the entirety of the Snowdon Horseshoe is spread-out with all ridge and summits visible allowing you to revel in the glory of completing one of the best walks in Britain. 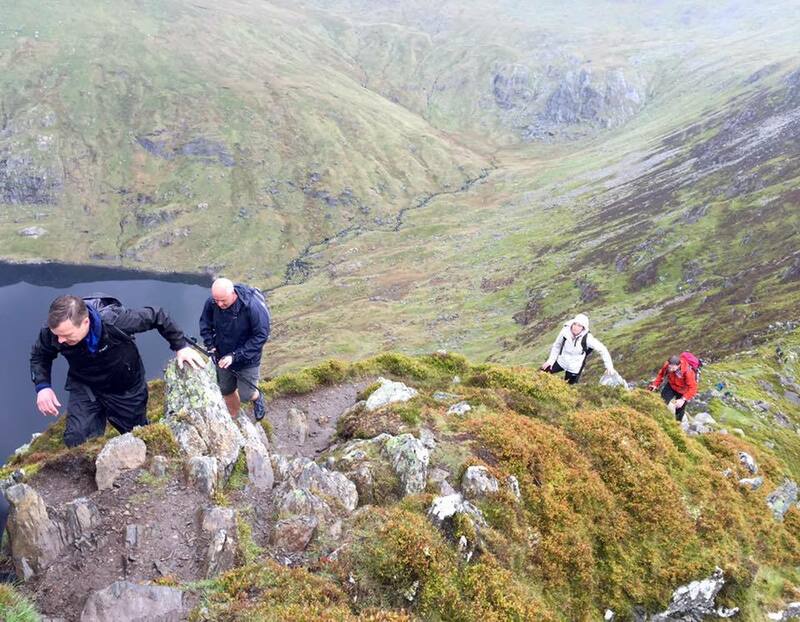 If you have completed the Snowdon Horseshoe then we would love to hear your thoughts and see your pictures. Any questions on the Snowdon Horseshoe can be asked below or on the Snowdon Walks Facebook page.